American Paper Town | Print, Cut, Paste, Craft! From the point of view of someone from Europe, American houses look a lot like doll houses, and everything seems to come out of a movie at first. I find the architectural styles of older American towns fascinating and beautiful and this interest is what inspired me in this project. 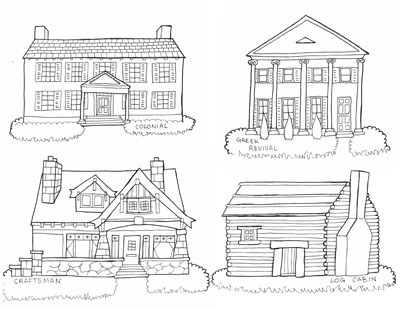 I designed 7 houses in 7 different styles: Italianate, Tudor revival, Greek revival, Craftsman, Victorian, Colonial and Log Cabin. I looked at pictures of real houses for inspiration although these are not exactly perfect copies in most cases. I also decided to draw four classic cars, although they are not all American in this case: I couldn’t help but add a VW Beetle and a Fiat 500! 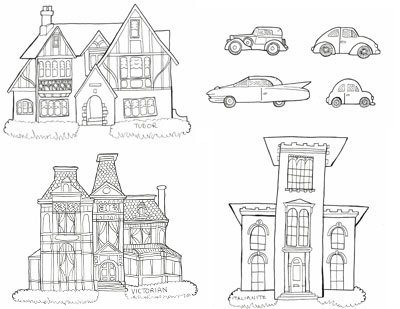 You can color them or not, and you can print them on cardstock, cut them out and create your own little town. I think they would be cute even just as wall decorations. Click on the image to get the hi-resolution printable version.